Does rooftop agility at various courses. I made because I wanted graceful armor. Personally gained 1.1k+ marks so far with it. User defined food id, (lobster by default #379) . Loots graceful marks that it's on the same platform as. Courses: Must have at least one food to run currently. Eats at all courses. I may add more later but I also don't want to mess with the prem ones by releasing all the courses free. Forums won't let me use the image tags anymore so here are links. if i bring food WITH ME to polli /relleka will it eat it? Yes required to run. Thanks for asking I'll add to main post. Also need to add a shut off when out of food tomorrow if not banking. Impressive. Thanks for the great contribution, I'll probably use this. Thanks and you're welcome if you do please post a progress report. I have had multiple 24hr+ but didn't plan on releasing at first so didn't screeny them. not working? maybe im doing something wrong? One second I'll check it. Only tested Cammy after adding gui. Not sure why it's not working. Pushing an update for paint related things but it's working at pol for me. I only brought 4 lobs.. maybe i need more? Requires just more then 0 Same thing with null for coruse? Seems to be something with the repository. When I run the exact same version local it works but when I add on repository it doesn't. I'll have to figure it out after my dentist appointment. Yeah not working. Although will deffo use this once it's fixed. I can't see the point of having to pay for a whole script just to gain a few faster agility levels at seers. So this would be very handy. How long does it take to get full graceful? 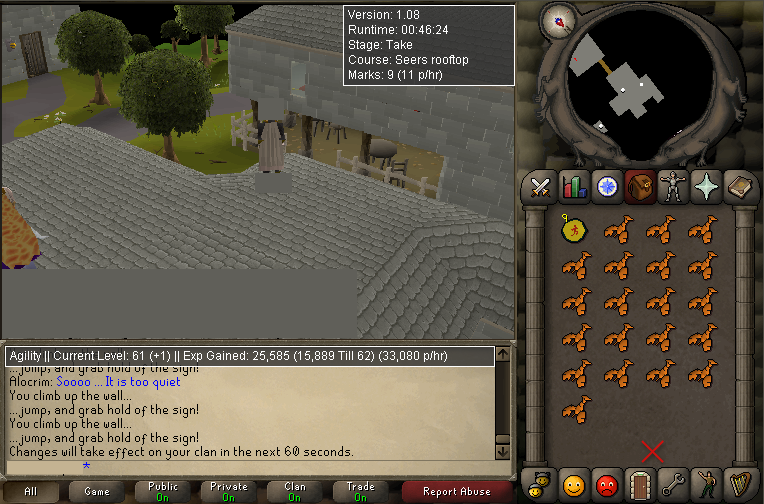 Just found out about rooftop agility and searched for a script and hey, I found it. Gonna try it out but now my agility is only 1 and I'll get it to 10 as soon as possible but is the Draynor Village course scripted? Literately just walked in the house. Opening eclipse now. Edit: Pretty sure I got it fixed now. I'll give it ago at seers now. That's what I'm doing next. Small tweaks to cammy and Rel courses for slight speed boost. When does it eat? I just got down to 15/70 HP so i had to eat manually. Edit: Running for 5 hours now at seers.